This is the easiest vegan pizza that you’ll ever make! Get a vegetable-loaded easy vegan dinner on the table FAST with this quick easy pizza crust hack! Vegan. ***This post contains affiliate links. If you’d like more information about what that means you can read my disclosure policy here. If I could choose only one food to eat for the rest of my life, I would definitely pick pizza. I love alllll types of pizza. Actually, I don’t think I’ve ever met a pizza that I didn’t like! We make pizza quite often at home. If I’m trying to watch our gluten intake that week than I make this gluten-free quinoa crust pizza— it’s so good! If I have a couple free hours I’ll make pizza dough from scratch, but to be honest, that doesn’t happen that often. If you do have the time, this is our favorite homemade pizza dough recipe. Most nights I don’t have a lot of time to cook and I just need something fast and healthy for dinner, like this 15-minute pistachio pesto pasta. This quick easy pizza crust hack is one of my favorite ways to get a yummy easy vegan dinner ready super fast! Plus, you only need to use one sheet pan for the whole meal! Less clean-up, yay! Zucchini crust pizza with beet hummus spread is the best lightened up version of regular cheese pizza I’ve ever tried! You can load it up with as many veggies as you like! Gluten-free. Do you have any fun plans for the holiday? We went to a friends party yesterday and spent most of the day relaxing, swimming, and playing with sparklers. It was one of those parties where everyone brings a dish and you end up with a huge spread– I mean gigantic! We brought cilantro lime bean salad. It’s one of my favorite dishes to bring to parties or any activities that you do outside because the dressing is olive oil based so you don’t have to worry about keeping it cold. Plus, it goes with pretty much everything! I wish I could have brought this zucchini crust pizza to the party for everyone to try but I would have had to make 5-6 of them for everyone to get a taste! I think it’s more of a small group sized appetizer or for one of those days when you need a pizza all to yourself. I think we all have days like that! Everything you might find in a graveyard has made its way into this devilishly spooky pizza! 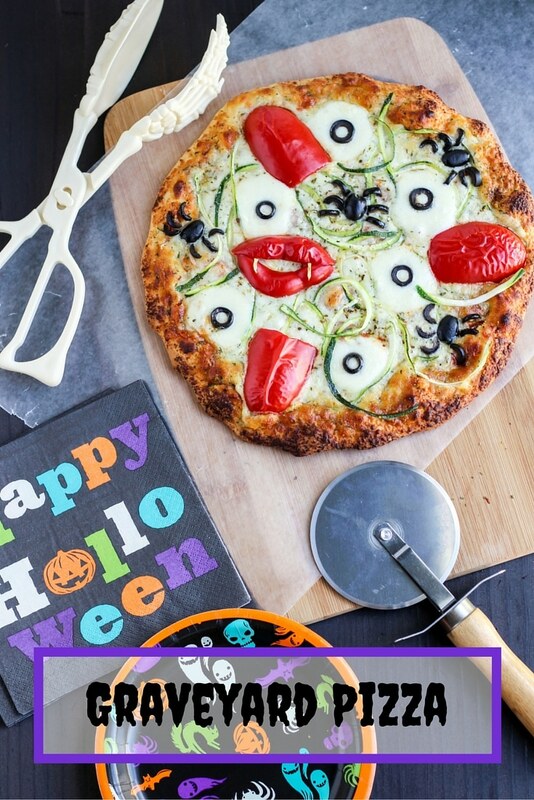 Use a frozen pizza for the base but scare it up with eyeballs, spiders, tongues, vampire fangs, and worms for your kids before you go out trick or treating on Halloween! Vegetarian. What could be better to have for dinner on Halloween than a graveyard pizza? Nothing! It’s the only night of the year that it’s acceptable to eat spiders, tongues, worms, and eyeballs! I’m telling you, the kids will love this. The best part is that it’s super easy to assemble, and if you use a frozen pizza for the base, all you have to do is make your spooky toppings. Of course, you can make your own pizza dough, but I’m looking for a quick dinner to whip up before going out for the night! I don’t want to worry about clean up or being in the kitchen for hours. Kids love pizza, and they won’t even know they’re eating a bunch of veggies. My mom used to make food like this for us when we were little, we loved it, the holidays were always magical at our house!